"Borax", a small black and white fox terrier, was adopted by A Company, 22 Battalion during early 1940, after he was left behind in Trentham by his earlier posting with the 19 Battalion. When the 22 Battalion sailed on 2 May 1940, Borax was smuggled aboard but was found a few days later. As the official History records, he accompanied the Battalion to England where he continued to present himself in full uniform and often turned out on parades. And apart from two photographs, that has been the extent of the information available on Borax. How did he get on board the X3 Transport? Who looked after him, and what happened when the Battalion was shipped out to Greece? Many of the "originals" would have known the story. Only Terry McLean the journalist ("Tired Terry" to the men) wrote it down. Here is Terry's telling of the story. His manuscript is amongst his papers, lodged in the Alexander Turnbull Library. 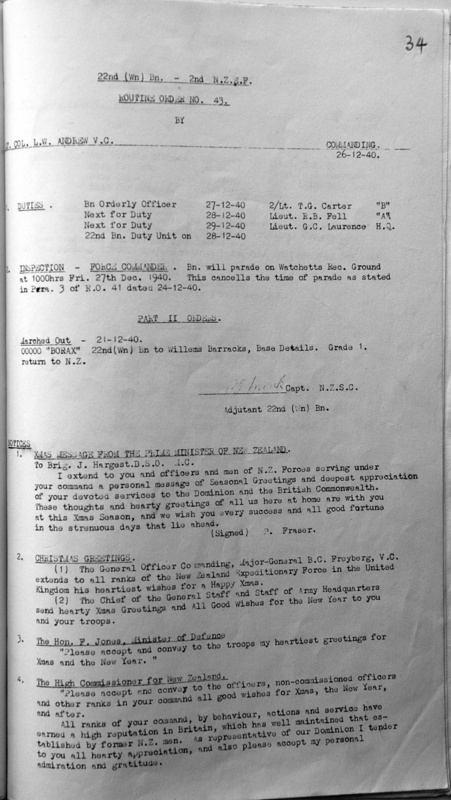 Towards the end of January 1940, an unexpected recruit posted himself to the battalion. Someone instantly called him “Borax”. He was a semi-fox terrier who was only a little cross-eyed and only a little lovable. He would not yield to caress and he made his home where he pleased, without distinction as to company or platoon. He had enormous, eccentric skill as a cricket fielder, catching a ball in the air with gigantic, convulsive leaps and snapping up a rolling one off the ground with the skill of genius. Borax trained hard for the cricket held in the sports periods on Wednesday afternoons. At any hour of the day or night he would catch stones flung for him by the soldiers and he would even swallow the small ones if others were thrown too quickly in gestures disparaging to his skill. No one had thought of a Borax for the Battalion. Within a few days, no one doubted that he must stay. His piercingly stigmatic glance into nothingness, his crankiness of temperament, his marvellous skill with a ball or stone, these and many other things about him were engaging. In any case, Borax had a mind of his own. He had apparently decided to stay and that, for the time being, was the end of the matter. The whispers of a sailing date sounded through the battalion like the rustling of leaves in a wind. The authorised marking of clothes pointed the date. Vaccination made certain the time could not be far away. And the publication of an order relating to a State reception and a farewell march through the streets of Wellington on 27 April clinched the accuracy of the rumour that the departure would be about the end of the month. The general excitement affected the workings of the committee self-appointed to protect the interests of Borax. Soon after return from final leave, the committee had addressed a notably respectful request for permission to take the dog overseas. The request had been declined and the committee, “in committee”, after expressing its disapproval of the reply in the strongest terms, determined upon ways and means. In pursuance of these, Pte Booth and comrades of A Coy acquired an extra kitbag from the QM store and at odd times practised the off manoeuvre of securing Borax in the bag, with just his nose showing, and carrying him up and down a ladder placed against the boiler house. Borax never wanted in intelligence and he soon caught on, but he was not quite well-bred enough to conceal a look of utter desolation and disgust whenever he saw Booth and his henchmen arranging another practice, down behind the showers. On the morning of Sunday 28 Apr, an advance party headed by the Colonel departed for the ship. The excitement soon became frantic. Kitbags were stacked for the baggage party. The battalion paraded. The wait, as always, was long. The transport, according to the Army, was the X3. It soon proved to be more exciting than the dry nomenclature suggested. It was the Canadian Pacific liner, Empress of Britain, of 43,000 tons, one of the largest and most luxurious liners in the world. Even Lt Lovie, a Great War veteran whose invariable reply to complaints had been “You ain’t seen nothing yet!” was silenced by a size and quality of transport undreamed of by soldiers of the First World War. The battalion filed silently aboard. Borax was put in his bag and carried up the gangway and not a member of the embarkation staff thought anything was amiss. The Empress of Britain pulled away from the wharf on the following morning, Thursday 2 May, and that afternoon sailed from the harbour. 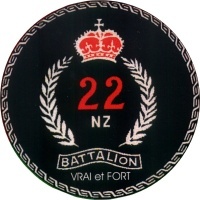 The strength of the Battalion was 756 all ranks. The total included 41 officers, eight warrant officers, 44 sergeants and 663 other ranks (and one dog). On the first day out, the ineffable Borax was the cause of trouble. “The soldier or soldiers responsible for bringing on board the dog commonly known as “Borax” “, as Routine Orders phrased it, was ordered to report to unit headquarters. After wresting with his conscience for some time, Pte Booth at last confessed the hideous deed. Business with Borax it seemed, was gratifyingly brisk. Booth’s confession was the third on the list. Two sergeants had forestalled him with categoric confessions. There was some speculation about the motives of the sergeants. At any rate, plethora of confessions or not, Borax was arrested. Authority was pleased to be stern and Brutus-like in reaction to the first tentative requests for the dog’s release. Authority having been proved there was yielding in the granite and Borax at last was freed. He roamed the ship perfectly happy after that. On 12 and 13 August, some of the first severe fights in the Battle of Britain were staged above Aldershot and over the Channel. At 0115 hrs on 16 August a raider bombed Mytchett and in the afternoon of the same day seven enemy planes, thought at first to be an RAF formation, dropped bombs about two miles from the camp and machine-gunned the streets of North Camp. Captain Monk, the adjutant, was taking a shower when the planes appeared. He sped naked for a slit trench. Diving for cover had become a serious occupation and Borax was not least in the unit in skill. It was possible to tell where he was. Loud and lurid language told, plainly enough, that Borax was happily at work, digging for rats or snuffing about the head of a soldier. Nothing seemed to shake Borax’s belief that even the shoddiest slit trench was a place of romance. Borax had never been much out of the news. He had been made a member of the Tailwaggers’ Club of Great Britain and a gentleman connected with the New York World’s Fair took the trouble to enquire about him. The girls of the Hutt Valley High School in Wellington made a blanket cover for him for the English winter and Borax acknowledged its receipt with the cable, “Many thanks. Yelps. Borax.” A Camberley veterinary surgeon pronounced him fit, though worn in the tooth from too much chewing of stone, and Pte Lindsay was gratifyingly discussing the circumstances with a friend within the observation of his Coy Commander. Later, there was a good deal of explaining done about reasons for being in town without a leave pass. Borax had come to mean a good deal to the battalion. His fate was strange and uncertain. When it became known that the unit was to go to Egypt, it was decided to leave him in England because of the unsuitability of the desert climate. On 26 Dec, he was posted to a rear party which comprised men who had been graded out of the battalion for medical reasons. Borax left the party not long afterward for the purpose, it was surmised, of finding his way back to the unit. He was not seen again. Borax on the ship "Empress of Britain" en route to England, May 1940.